Equities start the day lower as the best January since Bud Fox put up all those tacky decorations comes to an end (that song is amazing though…I think it was the Talking Heads?). I told myself I wouldn’t write another recap until the market traded down so you’re all welcome. You all owe me for the uninterrupted gains you’ve experienced in Jan. No joke I actually come in every day and expect the market to be higher. If there’s a dip I expect it to be erased, if there’s bad news I expect it to be met with buying, if a company misses earnings it’s probably going to trade up. If this is what a “melt up” looks like I hope it continues for a few more months because honestly, how great is this? 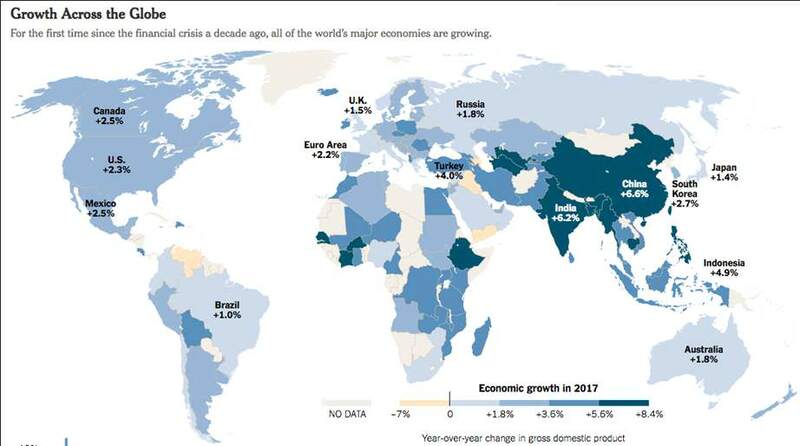 The NYT has a nice infographic on why markets around the world continue to rise and it all boils down to one thing: growth. Growth here, growth there, growth everywhere. In fact things are going so peachy abroad that the dollar continues to get slammed because we aren’t the best house in a bad neighborhood anymore. Most of the homes in our community have fixed up their bathrooms, thrown a fresh coat of paint on the outside, and spruced up their landscaping so the United States has some competition now. 7.3% in Jan for the S&P? Please. The Hang Seng is up 10%, Italy is up 9%, and Brazil is up 11%. So while we are having a decent party it’s not like we have a monopoly on Fireball shots. Big week for earnings my friends, big week. How have they been? Not bad actually. About 24% of the S&P has reported and all 11 sectors are experiencing both sales and earnings growth. In fact, 81% of the companies reporting so far have beat sales estimates and if that holds it would be the highest on record (factset data). Can you believe you are living thru this bull market? We will talk about it one day with fond remembrance. This run has been absolutely bonkers wealth creation. After the open I desperately wanted a Mr Pibb as JAB group said they would acquire Dr Pepper Snapple in an $18B deal. Now I don’t know about you but Diet Dr Pepper is literally the only diet drink I can stomach so the team from Germany got themselves a nice product. The market traded lower to start as we wiped out about 48 mins of gains from Friday. Down 50 bps with people blaming 10yr yields and a stronger dollar and NAFTA and weak tech moves and blah blah. Just excuses, look we can’t go up 1% every day even though it feels like we do. I mean for crying out loud you want a sentiment check? 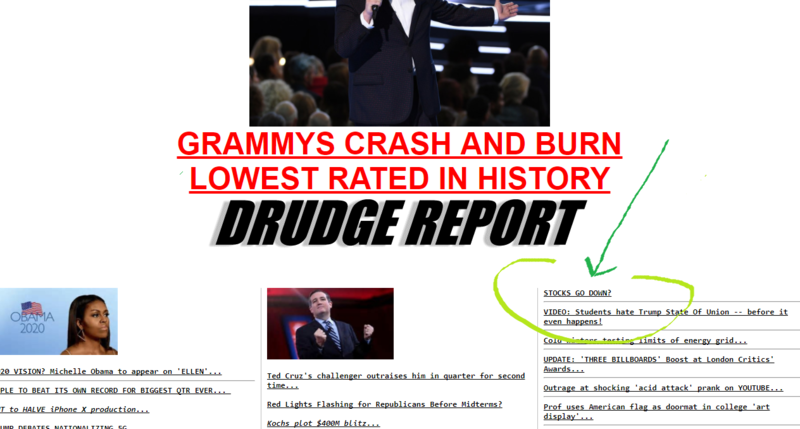 Look at this Drudge report headline link….is this really where we are? The low was made around 11am ET and by lunch we had scratched and clawed back to down 25bps. Winners DPS, GILD, NFLX, JEC, AMD, and MGM. Losers WYNN, F, IRM, AYI, and LRCX. If you were a yield play you got llama slammed today and I gotta think REIT investors are wringing much hands right now. By the way, on the “I’m super angry 1-20 scale” where does rolling your window down accidentally after getting a car wash rank? 50? 100? I’m such an idiot. The rest of the day actually brought more selling…can you believe it! Who knew that the S&P could actually close in the red? Though, to be fair, we were up 1.2% on Friday so today’s 68 bps drop didn’t even bring us back to there. So with MIFID currently destroying my will to live I think I should write more and entertain the FAs in my firm with stories of how amazing they are (they are all such nice people). Who knew that a regulator in Europe could have such a profound impact on a guy from Milwaukee. Anyway, let’s see what tomorrow brings because if we have two days in a row of red numbers we might literally witness the apocalypse. Final Score: Dow -68bps, S&P500 -68bps, Nasdaq -52bps, Rus2k -62bps. Are US Equities at risk of losing leadership? 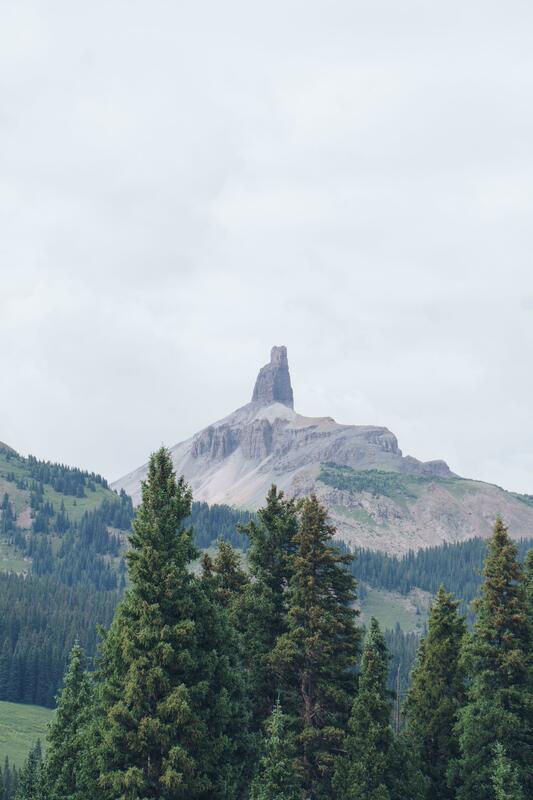 Can anyone name this mountain? It is in the U.S…. Fantastic post by Galloway here. Make sure you “The Four” because this guy is a legend. I wish he was Chicago GSB. Where are you on the Five Levels of Investing? Tonight we are going to end with Dude Perfect! To be completely honest how do I not have Dude Perfect as an advertiser on the recap? Feels like we should be business partners.